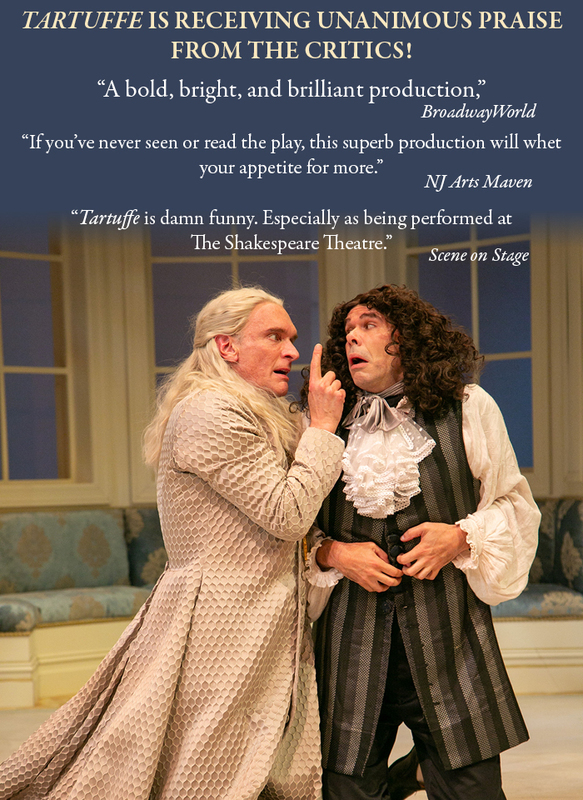 nj arts maven: First the Town Talked About It...Now the Critics Are Raving About “Tartuffe”! First the Town Talked About It...Now the Critics Are Raving About “Tartuffe”! Tartuffe, the consummate con man, hypocrite, and womanizer, meets his match under Molière's deft pen. A masterpiece of biting social commentary brilliantly enclosed in a swirl of witty verse, outrageous characters, and delightful machinations; you'll laugh and wince simultaneously as you hear how familiar this 17th century family sounds to our 21st century ears! Pictured: Brent Harris* as Tartuffe and Patrick Toon* as Orgon. Photo credit: Jerry Dalia, 2018. *Appearing courtesy of Actors' Equity Association, the Union of Professional Actors and Stage Managers. TARTUFFE is presented by special arrangement with Dramatists Play Service, Inc., New York.